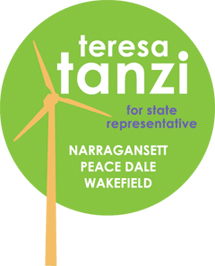 Since the space in a printed article is always limited, I felt it was important for voters to see my complete responses to the questions asked in the recent Narragansett Times story, so they can see for themselves the differences between the three candidates. I am proud of my experience as a State Representative and my accomplishments for our community. I think there are clear choices to be made when voting in the Primary on September 13th. Thank you for taking the time to become an informed voter! What are your proudest accomplishments since you have been in office? 2016 was  a banner year for me, and I am proudest of the 4 awards I received that represent the broad array of issues I work on, and the $10 million bike path bond money that will appear on the November ballot. I was named The Environmental Champion of the year by Clean Water Action for my work on passing the phaseout of all cesspools in RI and my commitment to the environment. RI's National Organization for Women honored me for the work I have done advocating for women and families through the legislation I've championed over the years and for being a strong voice for family friendly policies throughout the budget process. The RI Coalition Against Gun Violence also honored me for the work I have done protecting victims of domestic violence from armed abusers. And the streak began when I was honored by the Rhode Island Southern Fireman's League for defending volunteer fire districts against the unnecessary burdens some members of the General Assembly were trying to impose on them. These volunteers serve our community in so many ways, all while saving residents significant sums of money, and their recognition meant a lot to me. What are your future goals for the district? If reelected, I will continue to work on the many public health issues I champion, such as taking on big tobacco to prevent youth from smoking, and standing up to the powerful gun lobby by introducing bills that protect victims of domestic violence and limit those who can bring guns into schools to police officers. I will also be fighting for increased funding for higher education. For years I have been studying the impact URI has on the quality of life for the residents in our community and have come up with a few creative solutions. I am working with RIPTA and URI to bring more transit options to the towns of South Kingstown and Narragansett, and as a result there will be 12 new inbound and 12 new outbound trips daily during the school year beginning in September of 2017. Part two of my plan would turn all 16,000 student ID's into bus passes as part of the fees students currently pay for transportation, and we are very close to finalizing those numbers. This generation of students is more interested in using transit, and by working with URI, I have found ample opportunity to fund this program with minimal investment from the university. Of course, the entire community would benefit from increased frequency of Route 66 busses to and from Providence. I have a few other proposals in the earlier stages of discussion that would deal with housing and policies on who could bring cars on campus, and will keep you posted as those negotiations progress. I am committed to finishing the final mile to the beach for our bike path. The $10 million bond to complete and connect bike paths is on the November ballot this year as a direct result of my work, and it is critical to seeing this project through to completion. I promised the town when they approved a path that I would not rest until this project is funded, and I will keep up the fight! Is there anything we could be doing better on the state level? We have a crisis on our hands with respect to behavioral health services for children and adults alike in our state, and it is direct result of years of sustained cuts to the system. We need to commit to better screening, early intervention, timely referrals, attracting and maintaining a sufficient number of providers in our communities, and community based aftercare services for individuals no longer in crisis so that the cycle can be broken. I will fight for mental health parity on par with other healthcare services, and to restore our state to a place where opioid addiction treatment and prevention can counter the tragedies of the overdose epidemic we currently face. As a senior member on House Finance, I am in a position to make the case for increased funding, and with my expertise and knowledge of the systems, I can help move my colleagues to action. I get calls and emails from constituents almost every week revealing the horrors they personally suffer in dealing with the bureaucracy of state government. We have created an office of regulatory reform and it is finally staffed and working in collaboration with Commerce and other state agencies to review existing regulations and processes for individuals and businesses. The recent implementation of the lean government process and the customer service approach at DEM have created some improvements and my hope is that these lessons learned will translate into efficiencies at other agencies and departments. There are growing pains from any changes, but I am committed to changing the interactions we all have with government. These are the kinds of things that matter to small businesses and residents, and it is why I work to bring these agencies and their programs directly to my constituents, like when I hosted forums on student loan modifications, mortgage assistance for homeowners, and compliance for new taxes on rental properties. I will also continue my work on oversight and review of all of our economic development related tax incentives to make sure they are being spent in the manner intended while creating the desired result. For decades, hundreds of millions of dollars have been handed out with little-to-no-oversight. Since my first term in 2011, I have worked to include clear parameters on new incentives and review existing ones. Doing so would allow RI to reallocate millions of dollars each year to invest in programs we know are working for our state. If I once again receive the trust of the voters and return in January, I will continue my work with the fiscal staff and executive branch to create and implement clear pathways to achieve these goals.